On Wednesday night I travelled from Liverpool to Barrow with John O’Shea and Dave Lynch to help set up and run a radio station on a pedalo. Our home became Lanternhouse in Ulverston and our base of operations was Barrow Park’s Piel House, which constantly buzzed with music and activity. We were joined by fellow Liverpool artists from the Sound Network, who built an incredible crazy golf course to be enjoyed for free by members of the public. 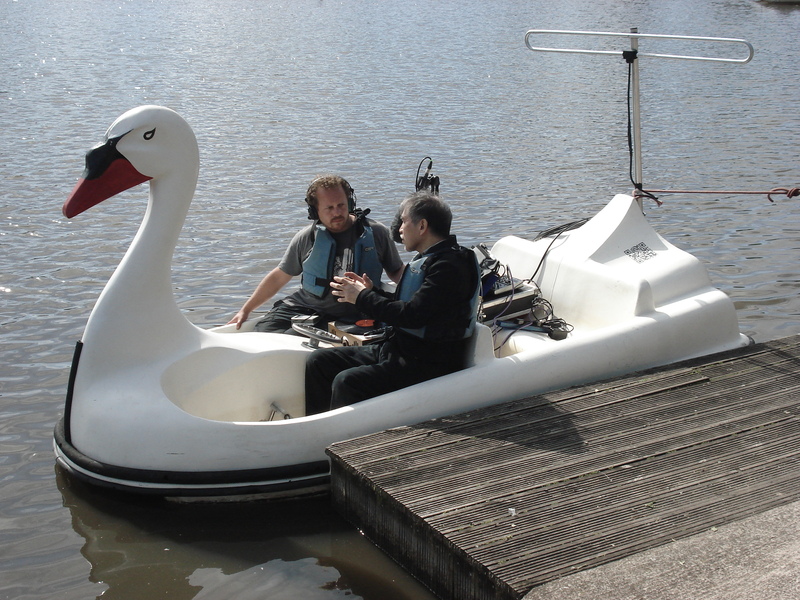 ‘Swan Pedalo Broadcasts’ hosted talks between the likes of the Mayor of Barrow and Octopus Collective’s Andrew Deakin (about the arts, birdsong and being attacked by a carp) as well as a plethora of live performances from sound artists such as AGF and Simon Jones. Forcing people into a confined space, on open water, where they had to pedal themselves around a pond somehow resulted in excellent conversations. These liaisons were broadcast live both around Barrow Park and online, which I had the pleasure of explaining to many of the park’s visitors, who assumed that we were up for hire. I’d never been to Barrow before, but now I could probably confess myself to be a bit of an expert on the area. Councillor Helen Wall and Radio 4′s Bob Dickinson chatted to me at length about Barrow’s history and art scene before their voyage on the pedalo, suggesting that Abbey Road could soon become a hub of artistic activity. Whilst local journalist/DJ Molly joined me on board for a chat about her experiences growing up in the town. Aside from the general lifting, carrying, unloading and scurrying that needs to be done in order to pull off a live event; I set up an internet radio station, delivered quite a few safety briefings and produced a fair amount of paperwork. Andrew Helm from Revolutions Brewing Company taught me the basics of brewing my own beer, I learned how to make origami ‘balloons’ from Japanese artist Ryoko Akama and composer Philip Jeck gave me some brilliant advice on buying a record player. One of my favourite conversations was with Japanese professor Tetsuo Kogawa after his performance on Saturday night, in which he disrupts and manipulates radio waves in order to produce ethereal sounds. Tetsuo is an expert on radio, he can make a transmitter with little more than some wire, a battery and a soldering iron (he even made an experimental transmitter for the Swan). It’s difficult to sum up five days worth of experience in a single blog post, so I’m not going to be fool enough to try.